Step 1: Line up your 4 disposable cups. Assign each cup one of the following colors: Red, white, light green and dark green. To the white cup, add 9 grams of Vanilla Powder and 13 grams of Vegetable Glycerin. To the red cup, add the 12 grams of Rose Clay, 22 grams of Vegetable Glycerin, 6 grams of the tomato red colorant and 10 grams of the neon pink soap colorant. To the light green cup, add 10 grams Kaolin Clay Powder, 20 grams of Vegetable Glycerin, 20 drops of the lime green colorant, and 2 grams of the neon green colorant. Finally, to the fourth cup, add 12 grams of the green clay, 21 grams of vegetable glycerin, and 7 grams of the neon green colorant. Stir the contents of each cup separately to make a paste. Set them aside, you will need them in another step. 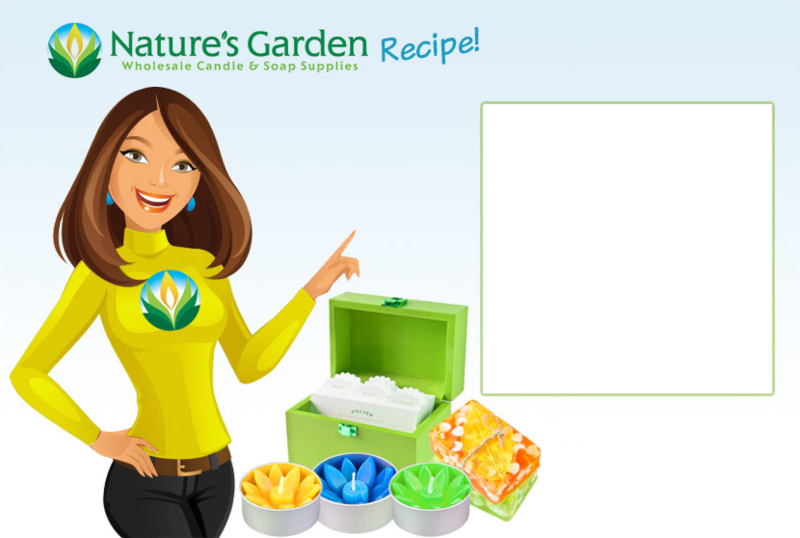 Step 2: Using your microwave safe glass container, weigh out and melt 1408 grams of Natures Garden yogurt soap base. You will want to melt the soap in 30 seconds increments, stirring in between each 30 second burst. Keep microwaving the soap until it is all in a liquid state. Step 3: Then, add the 70 grams of Moonlight Tuberose fragrance oil. Stir well to incorporate the ingredients. Step 4: Now that all of your melted soap is scented, carefully pour the soap into the cups containing the paste. You will need to add about 352 grams of scented soap to each one. Individually, stir each cup. Step 5: Next, you will need your square loaf mold. Place it in front of you. Step 6: Select two of your colored cups. Place one in your left hand and the other in your right hand. Starting with these two colors, begin to pour the two differently colored soaps at the same time. Pour the soap amount you want, then switch colors. Continue this until all of the soap has been used. Step 7: Lastly, spritz the soap with alcohol to remove any bubbles. Allow the loaf to fully set up before adding the whipped soap. Step 8: Once your soap has setup, we will prepare the whipped topping. First, weigh out 250 grams of the whipped soap base. Add 25 grams of the Moonlight Tuberose Fragrance Oil, 25 grams of vegetable glycerin, and 5 grams of vanilla powder. Use a hand mixer to whip the soap base to a fluffy frosting consistency. Step 9: Now, we will add the melt and pour soap base. So, using your microwave, melt 250 grams of the yogurt mp soap base. Then, add this melted mp base to the whipped soap. Finally, once again, use your hand mixer to mix the soap to a fluffy frosting consistency. Step 10: Begin topping the soap loaf with the whipped soap. Once you have topped the entire loaf, add a couple grams of the whole jasmine flowers. Then, dust the top with the diamond dust mica pigment. You will need less than a gram. Step 11: Remove the soap from the loaf mold. Then, use the mitre box and cutter to slice the soap. Your Moonlight Tuberose Swirled Melt and Pour Soap is now ready to use! Enjoy!